New BMW rider, Chaz Davies (above), has scored his maiden double win in world superbikes – and his first victory for BMW – taking out both races in emphatic style at round two of the 2013 eni FIM Superbike World Championship at Aragon in northern Spain overnight. With a winning margin of over five seconds in both races, the Welsh rider proved he has his new BMWS 1000RR sorted and is ready to embark on a serious 2013 championship charge. The Aragon haul sees Davies second in the standings (63 points) behind Sylvain Guintoli (Aprilia), who was second in both races and now leads the championship on 85 points. Sylvain Guintoli – with a pair of deuces at Aragon keeps him ahead in the championship standings. Australia’s Mark Aitchison joined the championship at Aragon with the Effenbert Liberty Racing Team but had no luck on his Ducati with technical problems forcing him to retire after 6 laps in race one, and a no start in race two. The MotorLand Aragon circuit proved to be a happy hunting ground for Chaz Davies again in 2013. Last year the Welsh rider scored his maiden podium here for Aprilia, but this year he scored an emphatic victory for his new BMW team after two potential winners were forced back to the pits. Eugene Laverty (Aprilia) and Tom Sykes (Kawasaki) experienced technical problems while they were in the lead, during lap 4 and 5 respectively, and retired early, Laverty rejoining the race later merely to test the work done by his crew. Davies was then never challenged and enjoyed a clear ride to the finish, crossing 5.2 seconds ahead of Aprilia’s Sylvain Guintoli in second place. Marco Melandri (BMW) with Kawasaki Racing Team’s Tom Sykes breathing down his neck. Melandri finished with a third and fifth placings. An unfortunate technical problem on the last lap stopped Davide Giugliano (Althea Racing Aprila) in his march to the line, with Honda’ Jonathan Rea taking fourth, Loris Baz (Kawasaki) fifth and Jules Cluzel (FIXI Crescent Suzuki) sixth. Carlos Checa returned to racing at Aragon after his massive round one crash at the island, and finished 7th on the Ducati Panigale. A Sunday to remember for Chaz Davies, who repeated his first race success for BMW and topped the day with a double win. He was unstoppable on his BMW in the Aragon heat and crossed the finish line with a 5 second margin over Sylvain Guintoli, still championship leader after race 2. 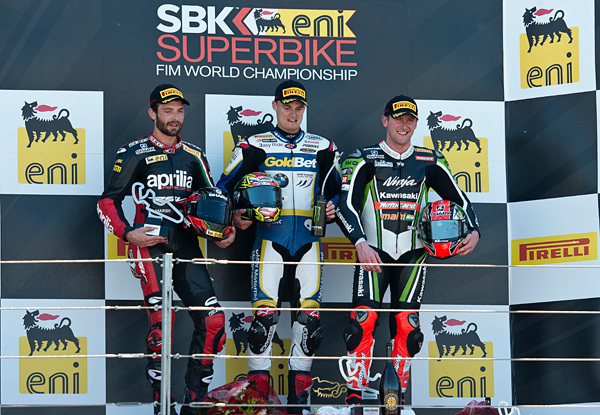 L-R – Sylvain Guintoli, Chaz Davies and Tom Sykes on the podium after Race 2. For Guintoli’s team mate, Eugene Laverty, race two proved a continuing nightmare, losing the front of his RSV4 on the opening lap of the race at turn 2. His disappointing day saw him lose his joint championship lead and the Irishman now sits third on the leader board on 45 points. Kawasaki’s smiling assassin, Tom Sykes, improved his race one performance in the later outing, and came through for third after battling Davide Giugliano who ended in fourth. Fifth place for Marco Melandri, ahead of Loris Baz, Jules CLuzel with Carlos Checa taking 8th at his home track.